I really love my chromebook, at least when I get to wrestle it off the wife. But every now and then I miss the fact that I can’t jump into the terminal and start tapping away. But I don’t really want to get rid of chomeOS, its great the way it is and duel booting seems to defeat the purpose of having a quick start “always on” laptop. So long story short, I wasn’t ready to go down the install ubuntu on your chromebook path. That was until I came across a great post on google+ (https://plus.google.com/u/0/112449749826562830126/posts/ZS9WaegrZYH) which describes a bunch of scripts called crouton that allow you to run ubuntu inside of chromeOS! Switching between the two systems is as easy as a key stroke, and it is instant. 1. Backup everything! Well if you live in the cloud this is not a problem as google is taking care of this for you, but this process WIPE YOUR DRIVE (You can restore chromeOS if you like, no harm no foul, but any data on your SSD will be GONE). Also, developer mode is less secure as Google is no longer watching your back, don’t be stupid with your new found power! 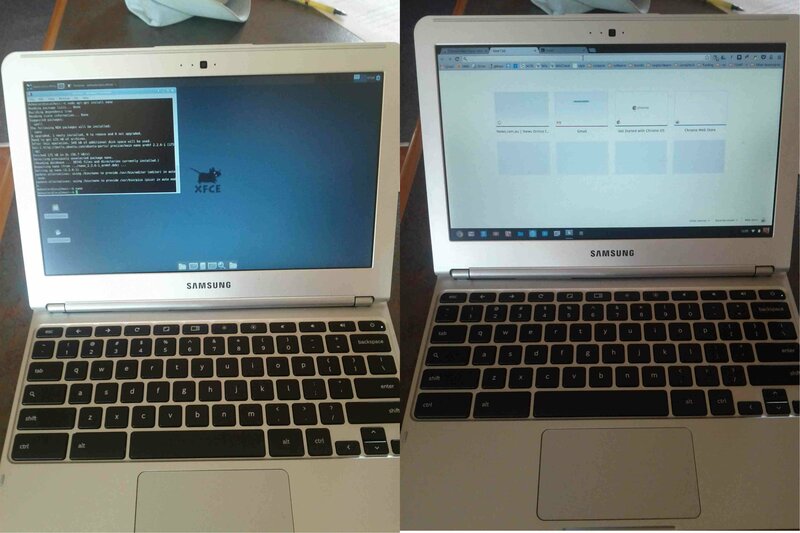 Identity crisis, Linux and ChromeOS side by side! 1. Power off and enter developer mode by tapping the power button while holding down ESC and REFRESH, this should bring up a scary “your OS is damaged” screen, now hit CTRL D, and following the on screen instructions press ENTER to switch to developer mode (this takes some time). 2. Once you are back to the login screen, type in your google credentials and restore you system, for me it seemed that everything was running a lot quicker than with the walled garden version, maybe I was dreaming. 3. Once you are up and running with your ChromeOS, open a browser and download crouton, use the file manager to check that it has downloaded to your download directory. 5. Follow the instructions to setup a sudo password! 6. Now: “sudo sh -e ~/Downloads/crouton -t xfce”. Note this will install xfce desktop (a light weight desktop that comes with xubuntu, really, its all you need), see the crouton page for more information on other options (Unity, if your that way inclined\-:). 8. After the system downloads and installs, at the prompt type “sudo startxfce4” to enter your new linux environment! So far this is great, to switch between stock chromeOS and xfce just use Ctrl+Alt+Shift+Back and Ctrl+Alt+Shift+Forward, how easy is that! Issues: yes! There is a little bit of instability, but I’ve found a quick switch between OS’s seems to calm things down. 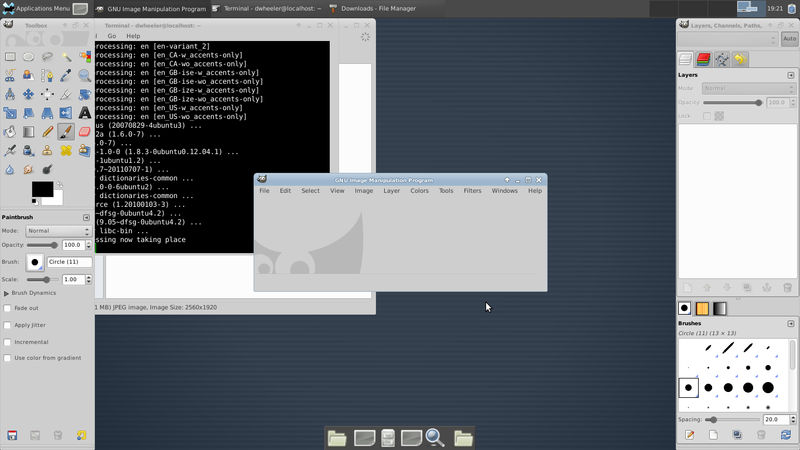 This entry was posted in Linux and tagged ChromeOS, duel boot, installation, linux, ubuntu by Dave Wheeler. Bookmark the permalink. Greetings have you noticed any of the instability issues work themselves out since you’ve done this? My wife stole my chromebook! So I have no idea! I still see rave reviews on the web for crouton, I would bet its better now. Also, if you have a CB give it a go, don’t like it just reset and your back to normal, cinch.